After being named the national champion in the diversion category of the GameDay Recycling Challenge, the University is ready for the next challenge… RecycleMania. Both annual recycling competitions are organized through a partnership of the National Wildlife Federation, College and University Recycling Coalition (CURC), RecycleMania, Inc., and the U.S. Environmental Protection Agency. The GameDay Recycling Challenge encourages universities and colleges to reduce waste associated with home football games. This year Rochester won the top spot for the “Diversion” category alongside Clemson University, the winner of the “Total Recycled” category for collecting a total of 123,661 pounds of materials that were recycled, composted, or donated. To make it to the competition’s “zero waste hall of fame”, at least 90% of waste must be diverted from landfills and incinerators, and instead composted, recycled, or repurposed. The University consistently achieved a diversion rate above 90% since 2015. To win the title of National Diversion Champion this year, the University diverted 91.71% of waste. The University won the GameDay challenge during the home football game against St. Lawrence University on October 6 as part of Meliora Weekend festivities. Volunteers acted as “zero waste rangers” to help game attendants correctly sort their waste into categories of trash, recycling, and compost. Amy Kadrie of University Facilities and Services worked with Dining Services to provide compostable materials, like biodegradable straws and food containers, as part of the event’s concessions and catering. To make the program a success, Kadrie formed a partnership with Athletics and Recreation, Horticulture and Grounds, and the University’s waste and recycling partner Waste Management. The GameDay Recycling Challenge is an offshoot of RecycleMania, an annual competition where colleges and universities across the United States and Canada compete to recycle and divert waste, while promoting the importance of sustainability in a campus setting. From February 3 through March 30 the University’s reported weights of landfill and recyclable materials will be ranked against other schools. RecycleMania posts weekly updates on each school’s rankings to encourage friendly competition between participants. This is the University of Rochester’s tenth year competing in RecycleMania. RecycleMania is a great way to showcase the University’s systems that promote sustainability. Rochester’s RecycleMania promotional events are led by Facilities Team Green and supported by many cosponsoring student groups, including Grassroots, Dining Team Green, GreenSpace, and EcopReps. As the official competition begins this week, the Kick-off Event will be held on Thursday, February 7 in Hirst Lounge from 4:30-8:30 p.m. There will be a raffle for zero waste tote bags, complete with sustainability fact note cards, water bottles, mugs, and more. Passersby will also have the option of playing trivia and a recycling sorting games. The following eight weeks will be filled with events and activities promoting sustainable practices on campus, with giveaways and prizes. 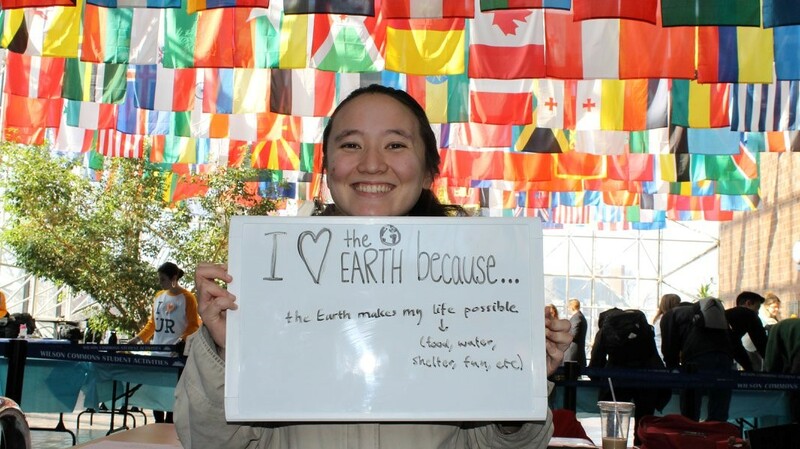 Some of the many highlights include the recycling sorting game to be held weekly outside the dining halls, a reusable water bottle giveaway and education event, and a Valentine’s Day photo booth for students and staff to express their love for the earth. RecycleMania ends on March 30, and throughout the month a variety of both on and off campus organizations will co-sponsor events, including the Rochester Citizens Climate Lobby and Impact Earth. See the full schedule of promotional events here. Visit the UR Sustainable Facebook page for updates and photos throughout the eight weeks of RecycleMania, and “like” the page to receive updates for all the fun events.